Euro Garden Hotel Humboldtkolonie, Hotel Germany. Limited Time Offer! The Euro GardenRead more Hotel has all the services one would expect of a four star hotel in Humboldtkolonie: Restaurant, Room Service, Bar, Non Smoking Rooms, Laundry, Television. 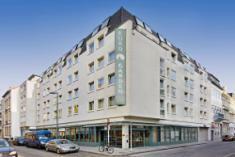 This establishment is more of a Luxury hotel .The hotel is located in the north-west section of Humboldtkolonie, at Cologne Germany, only 6 minutes by car from the city center.Take advantage of the sauna which is available at the hotel.